Springbok is world renowned as the Namaqualand Flower Capital and a perfect stopover on the main N7 highway between Cape Town and Namibia. The town lies in a narrow valley beween the high granite domes of the Klein Koperberge which are locally referred to as "klipkoppe". Originally known as Springbokfontein, after the many antelope that inhabited the region, the name was shorted to Springbok in 1911. 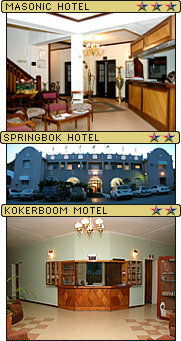 Springbok was established in 1862 and developed around a small hillock in the middle of the narrow valley. It became the communications, administrative, educational and commercial centre for the mining of this region. Due to its perfect location, Springbok serves as the ideal stopver when travelling either Northbound to Namibia or Southbound to Cape Town. Springbok’s first mine, it includes a walking trail offering views of the town from its western outskirts. Built in 1921 a magnificent example of stone masonry. Also known as "Klipkerk"
600 Indigenous Flower Species, 45 mammal species and 94 bird species. Including the Hester Malan Wild Flower garden featuring succulents. Dug in 1685 on Simon van der Stel’s instructions (east of Springbok, at Carolusberg). Town centre. Wrested from the British by Boer forces, commemorates the Anglo-Boer War (1899-1902). To the north of Springbok, a national monument, unused since 1871. On display at Komaggas, 50km along the Kleinzee road. Completed in 1929 and now used as the Namaqualand Museum.